Retinopathy of prematurity (ROP) has been divided into five stages. Stages 1 and 2 customarily get better on their own. Some eyes, however, go on to Stage 3 retinopathy of prematurity. This happens when new blood vessels start to grow from the retina toward the center of the eye, forming a ridge between retina that has blood vessels in the back of the eye, and the retina that does not have blood vessels in the front of the eye. This difference in the blood vessels of the retina is because the premature baby has not had the time while in the womb to allow the blood vessels within the retina to grow all the way from the optic nerve in the back of the eye to the front of the eye. 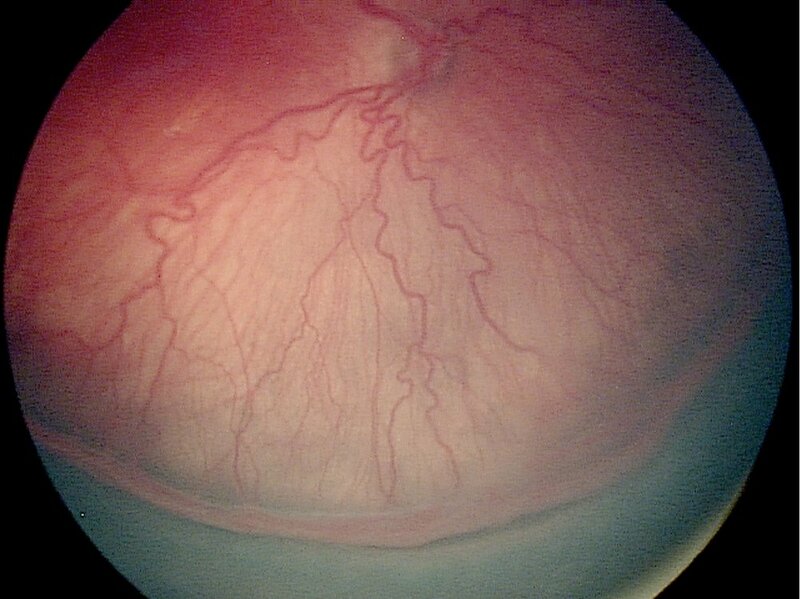 Stage 3 ROP exists when these disturbing new blood vessels grow out from the ridge in the retina toward the center of the eye. If this blood vessel growth becomes severe and is accompanied by “plus” disease, the child may reach the point where treatment of the peripheral retina with laser (or rarely freezing) treatment is performed. “Plus” disease is defined as enlarged and twisting blood vessels in the back part of the eye. Peripheral retinal treatment can reduce, but not eliminate, the chance of the ROP progressing to the potentially blinding stages 4 and 5. When stage 4 or 5 ROP is reached, the retina is detached and other therapies can be performed.One such therapy is scleral buckling, which involves encircling the eyeball with a silicone band to try and reduce the pulling on the retina. Other therapies include vitrectomy (removal of the gel-like substance called the vitreous that fills the back of the eye). Sometimes the removal of the lens as well is required during vitrectomy to try and eliminate as much pulling as possible from the retinal surface. Removal of the lens is performed if the retina is touching the back surface of the lens, which would make it impossible to enter the eye. When scleral buckling is considered the appropriate procedure, the success rate is 70% retinal reattachment. Vitreous surgery for stage 4B, where the retina responsible for central vision is detached, or stage 5, where all the retina is detached, had a success rate of 76% reattachment. Ambulatory vision is defined as being able to see objects and move around a room without stumbling or bumping into obstacles. Unfortunately, 28% of children even with appropriate management and vitreous surgery end up with no light perception. Recently, vitreous surgery is being performed earlier, at stage 4A, where the retina responsible for central vision remains attached, and shows promise of success rates of up to 90%. Visual results in this population are not available currently, but are suspected to be perhaps better than when surgery is performed at stage 4B or 5. The development of vision is dependent on many factors, much of which we probably don’t fully understand, but certainly issues relative to the child’s glasses needs, central nervous system development, and developing the “wiring” for vision based on competition between the two eyes are all factors that enter into the child’s final visual acuity. Fortunately, children are able to adapt to lower levels of vision and use their vision at levels much higher than what their measured visual acuity might suggest. Children with a visual acuity of 20/200, which would be classified as legally blind, very often function at a level much better than that when they are observed performing their daily tasks. by the development of drugs that can control this new blood vessel growth, as well as developments of microelectronics and other tissue manipulation techniques. In December of 2003, the results of the Early Treatment Retinopathy of Prematurity Study were released. They showed that treating eyes that are vascularly active with plus disease and with changes of ROP in zone 1 yielded fewer eyes going on to stages 4 and 5 (retinal detachment). The treatment performed in this study was primarily laser peripheral ablation and the eyes were treated within two days of diagnosis. This study does support earlier intervention and will reduce, hopefully, the number of children who go on to blindness from retinal detachment. Recently in the New England Journal of Medicine, an article appeared describing the use of Avastin in retinopathy of prematurity. This study basically concluded that in zone 1 retinopathy of prematurity, (more severe posterior retinopathy of prematurity) that Avastin was superior to laser treatment. However this was not the case for more peripheral retinopathy of prematurity. A number of people in the ophthalmic community have had difficulty with this study, finding it to not represent efficacious laser treatment, not presenting data completely correctly, and describing treatment in a population that was two-thirds Hispanic and not truly representing a balanced population of the United States. The article has raised concern such that editorials have been written for the journal Ophthalmology, several letters and editorials have been submitted to the New England Journal of Medicine, and also to the journalPediatrics. The article that did appear in the New England Journal of Medicine showed a laser failure rate of 42% for zone 1 retinopathy of prematurity. This suggests an extremely high failure rate which does not mirror what is seen in most centers that routinely perform laser for retinopathy of prematurity. In a similar study, one group published a failure rate of 18% in this type of population. In a national study, a failure rate for laser for both zone 1 posterior and zone 2 more peripheral retinopathy of prematurity had the failure rate of 9%. The issues of pharmacological risks of Avastin, an anti-VEGF drug, to developing children is also not explored with any significant discussion in this article. Also this drug is given by intraocular injection and the risks of intraocular injection are not without concern. Eyes can need to be removed following intraocular injection if bad infection ensues. The risk of this is perhaps one in a thousand of developing infection and one-third of those eyes in many studies end up totally blind. The risk of laser is perhaps one in ten thousand where the eye can be devastatingly damaged by anterior segment ischemia. Although there certainly may be a role for Avastin in the treatment of retinopathy of prematurity, this article does not clearly define its application, dosing, or safety issues of using a pharmacologic agent in the developing infant. To download the PRRF ROP brochure in English click here. To download the PRRF ROP brochure in Spanish click here.